Prepare to have your blood run cold, your heart race and your brow bead with sweat: this anthology of horror stories ranges from the starkly terrifying to the tantalizingly creepy. There's magic mixed in with the chalk dust, evil lurking in the textbooks, malevolence biding its time in the labs and perhaps something even more horrifying in the student cafeteria. Chilling tales born from the dark shadows of campuses across Canada. 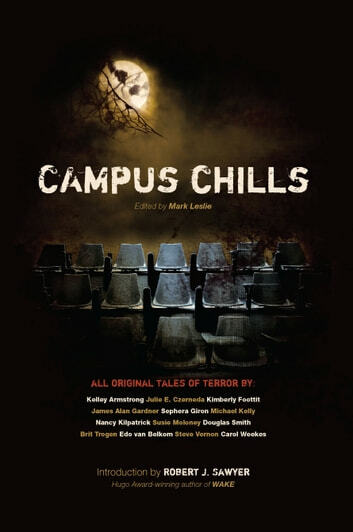 Edited by Mark Leslie, the author of the non-fiction paranormal books HAUNTED HAMILTON, SPOOKY SUDBURY, TOMES OF TERROR and CREEPY CAPITAL and introduced by Canada's Dean of Science Fiction, Robert J. Sawyer, Campus Chills features thirteen all original tales of terror by Kelley Armstrong, Julie E. Czerneda, Kimberly Foottit, James Alan Gardner, Sephera Giron, Michael Kelly, Nancy Kilpatrick, Susie Moloney, Douglas Smith, Brit Trogen, Edo van Belkom, Steve Vernon and Carol Weekes.